Applicants must be international students who apply for, and receive a conditional offer, to commence study at ECC from October 2018 to 2020, on a packaged pathway course to ECU. The scholarships are only open to future students seeking to study an ECC Diploma pathway program that is packaged with an ECU undergraduate degree by coursework. Applicants can package with ELICOS. This scholarship is open to prospective students. Questions about this scholarship can be directed to international.partnerships@ecu.edu.au. 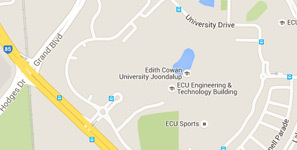 intend to study an undergraduate by coursework degree at ECU Joondalup, ECU Mount Lawley, or ECU South West (Bunbury). The scholarship recipient may be ineligible for a scholarship if they are in receipt of a government, or industry or ECU grant (sponsorship or scholarship) during the term of the scholarship. This is at the discretion of ECU. The scholarship funds can only be used for tuition fees and cannot be used for any other student expense. Scholarship funds are applied on a per unit basis as at the academic census date of each semester or enrolment period. The scholarship cannot be retained if a recipient defers their studies for more than one semester. The scholarship recipient must pay their tuition fees within the stipulated payment deadlines, failure to do so may (in ECU's absolute discretion) negate the scholarship and the tuition fee structure will revert to full-fee international tuition effective from the enrolment period when the failure occurs. You can apply online direct to ECC. The scholarship can be revoked if academic progress, dates and deadlines are not met, effective from the enrolment period when this occurs.